What is the Vimeo Feature? The Vimeo Feature enables you to automatically sync your Vimeo channel, user feed, or single video into your app. In this article we’ll go over how to use this feature. What are some use cases of Vimeo? Does your church have a Vimeo account with video sermons? You can use the Vimeo feature to bring those sermons into your app! If you’re building a fitness app you can use the Vimeo feature to bring in workout videos into your app. Have a cooking app? You can use the Vimeo feature to add video recipes to your app. What is the Vimeo Feature’s primary function and what are the steps to accomplish it? Now that you have some suggestions on how to use the Vimeo feature, let’s go over how to set it up. When you create an instance of the Vimeo feature you’ll see the option to pick between three content types. Channel Feed: This is a collection of videos from multiple users. If you want to showcase a channel of videos that your users would find helpful then this would be your best option. User Feed: This is a collection of videos from one user or account on Vimeo. If you’re a content creator, or you want to showcase more than one of your videos, then this would be the best option for you. Single Video: This is the link for a single video on the Vimeo platform. This is a good option if you want to showcase only one video in the Vimeo feature. After you have selected the content type, grab the URL to that feed or video and paste it into the “URL” filed. Congratulations! You have now added your Vimeo feed or video to your app! One thing to note is that you’ll need to make sure that your videos are marked as “public” so that they can be accessed easily within the app. If you have multiple Vimeo Features for feeds or single videos, you can use the Folder feature to categorize them into a master Feature. 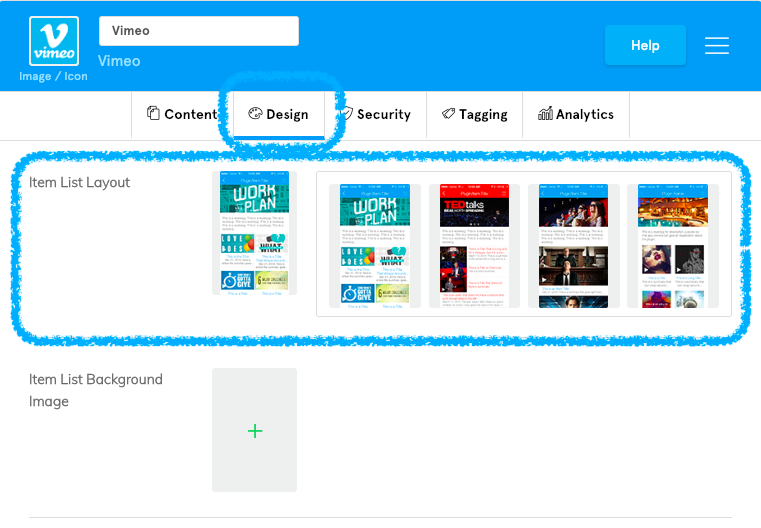 You can use the Design tab to change how your Vimeo videos are displayed. Even if you have feeds, you may want to manually customize your content by adding video and audio to the same item, for example. To do so, check out the Media Center Manual feature.